Cut the ribs into three equal sections. Place the ribs on a large plate and rub the spices into the ribs. Add the beef broth to the bottom of the Instant Pot. Place the metal rack on the bottom of the Instant Pot. Arrange the seasoned pork ribs into a pyramid shape by standing them on end and laying them against one another. Sprinkle any left over seasoning over the top of the ribs. 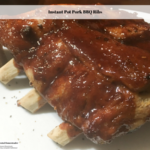 When the timer goes off, allow the pressure to release naturally, then place ribs on a broiler pan and brush with BBQ sauce. Broil for about 5 minutes or until the BBQ sauce is bubbly and slightly carmalized.